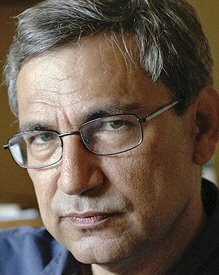 Orhan Pamuk is a perfect candidate for the 2006 Nobel Prize for Literature for his contribution to World Literature with a consistent body of work, both fiction and nonfiction. Other excellent choices for this prize would be Adonis (Ali Ahmad Said), Margaret Atwood, Don DeLillo, E.L. Doctorow, Ryszard Kapuscinski, Milan Kundera, Alice Munro, Joyce Carol Oates, Amos Oz, Philip Roth, Salman Rushdie and John Updike. 1.- he is not an English speaking author (last year it was Pinter, so I wouldn't vote for another Briton or American). 2.- He is a muslim, which would be very politically correct. 3.- He has been prosecuted in his own country. Unfortunately, as you can see, all these "merits" are extra-literary, but I'm afraid that they will count more than the quality of his literature. And, of course, I don't mean he doesn't deserve the prize; only that the jury pays more attention to the author's biography. Yes - I agree with you, Jacobo. The Nobel Prize has become very politicised nowadays. Perhaps even in the early period of the Prize it has been so. Pamuk is good but it will be his extra-literary merits that will reward him.